Pasquotank Correctional Institution is a high security prison for adult males located in Elizabeth City. Pasquotank houses close and minimum custody adult felon males. It is comprised of a close custody building and a minimum custody unit. Offenders are sent to Pasquotank based on classification reassignment, demotions in custody, administrative transfer from other close security prisons, segregation housing needs and mental health program needs. The prison is comprised of four buildings which, in addition to offender housing, include a visiting area, recreation area, dining hall, warehouse, vocational and academic classrooms, medical and mental health offices, and administrative offices. Offenders work in kitchen, janitorial and maintenance duties. Minimum security offenders work in community work squads, Department of Transportation squads and for Pasquotank County recycling. There is also an education program that prepares offenders for the GED test, as well as vocational programs. Pasquotank was dedicated March 27, 1996. The $33.7 million construction project was funded in July, 1991 as part of a $103 million prison construction program. Adjacent to the institution is a 256-bed minimum security prison funded in the $87.5 million prison construction program approved by the General Assembly in July 1993. 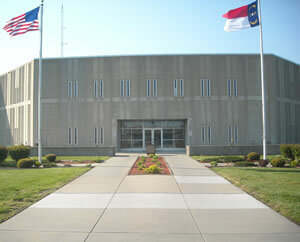 Pasquotank was built using the same design as Foothills and Marion correctional institutions in western North Carolina. Close Custody (visitation by appointment only) -- Sunday – 8:15 – 9:15 a.m., 9:30 – 10:30 p.m., 1:15 - 2:15 p.m., 2:30 - 3:30 p.m.; Monday – Thursday – 8:15 – 10:15 a.m. and 1:15 – 3:15 p.m. Appointments must be scheduled 72 hours prior to the visit by calling (252) 331-4765. Offenders may have up to three adult visitors. All visitors must be on the offender's approved visitor's list. Take U.S. 64 to Williamston and then U.S. 17 to Elizabeth City. Take U.S. 17/158 north for about 6 miles. The prison is on your left.